Having fun with Lucky Limeade, Pool Party and the gorgeous DSP. The stamp set Sip by Sip is sadly retired but the Tea Shoppe set would work also. Just a nice card for a friend who you like to share a cuppa with. Loving the Baker's Twine in different colours too. Christmas should be fun, simple and Fabulous! 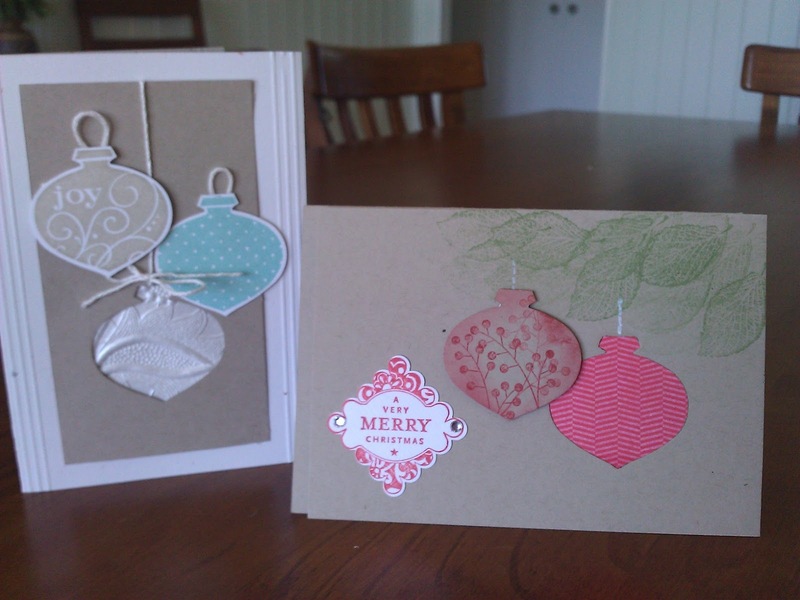 So this year to ease the stress I am going to hold Christmas Card Classes each month and make 10 cards so that by the end of November I will have a beautiful stack of cards and gift tags and decorations!! If you would like to join me please drop me a line I would love to have your company. the first class will be Sunday August 26 at my home in Rockhampton. These will be the first 2 cards we make. Stampin' Up! tools make it so easy. Love Collage! So may great Stampin Up tools !!! Another of my Collage frames. This time with a wedding flavour. These make beautiful gifts and are lovely to personalise with ephemera that holds significance for you and the recipient. I have used the Lovely Letters Alphabet, Tiny Tags stamp set and Punch, Whimsical Words and Always stampsets. Curly Label Punch, Scallop square punch, Bird Punch, both Square Punches, the small circle punch, Antique Brad, Crumb cake Seam Binding. And I did mix and match from my overflowing craft box of goodies. Stampin' Up! Products make it so easy. you can contact me to get some supplies for yourself. This is a birthday card for a 21 yr old who loves Pink, and sparkles- so there is plenty of bling. On the facing page is a pocket to put in a gift card, and 2 tags to write messages on. It closes and ties with a bow of pink pirouette ribbon. I have also done this style for wedding cards and for special birthdays. just email me if you would like instructions. Another version, using Always stamp set. I do have a thing for squares and geometry. This little collection uses many Stampin' Up! products but also a few from my collections over the years. the floral paper is from Liberty of London from a recent trip, buttons and hat pin from my stash. This is all new to me. I love to paper craft and love seeing so many photos from other amazing paper artists so thought I would also share. So here goes!!! I designed this cottage garden layout and have used it quite a few times (more photos coming) from the fabulous Best of Everything set and sentiments and embellishment from the great Kindness Matters set. I have used Apricot Appeal (using up old stashes!) and Night of Navy. I have cut the front of the card with a ripple border to expose the interior and have stamped the half doily from Kindness Matters along the inside. I neatened up the edge using the thick end of the Stamp n'Write marker. this is the inside - on it's side. Mother's Day cards are always fun to make because you can go overboard with beautiful things!! Anyway, I have layered the card on Night of Navy Cardstock, tied a matching pink organza ribbon around the rose layered with Navy Grosgrain ribbon and used a Hodgepodge Hardware Brad to anchor the bow. The sentiment is from Short and Sweet - a very versatile set - anchored with a Hodgepodge Frame. (This too is no longer availalbe from Stampin Up but I can't bear to part with anything so I am using them up slowly - I'm sure you know what I mean). I almost always decorate the inside as well and have stamped the Happy Mother's Day sentiment, along with the Fabulous Foliate Wheel ( this one is current!) in the Navy. The Gorgeous Heart from the Always Stamp set (sadly retired), is very useful for thankyou cards for that special person, but any heart stamp or punch could be adapted. Here I have embellished the heart with a few flowers and some sparkle. The combination of Wild Wasabi and Night of Navy with Bashful Blue is a refreshing combination. The sentiment is from Kindness Matters, with pocket silhouettes stamped for the base, and framed nicely with the Modern Label Punch, and a butterfly embosslit. Always used again here with the heart and the bird for a very elegant thankyou using Baja Breeze. The seam binding ties very beautiful soft bows and is very easy to use, and looks lovely with the antique brads. I love my modern label punch for a focal point. I love the Stampin' Up! Soft Subltes range and have been experimenting with a favourite stamp set Organic Grace (now retired) with 6 different looks. So Saffron, Perfect Plum, Pink Pirouette, Baja Breeze, Bashful Blue and Marina Mist, all in combination with Certainly Celery orWild Wasabi ( a very versatile colour) have been stamped and assembled using different layouts and embellishments. I like the different ways they came together. All these colours are so easy to use. You could use any stampset with a floral theme. Pocket Silhouettes also adds a good base to the foliage. "Pocket Silhouettes" is my all time favourite 'go- to 'stamp set and I have used it today to make a Mother's Day card. Using Baja Breeze card and matching Ribbon as the base, I have stamped a cottage garden in a square. I then Matted that on Night of Navy cardstock and layered that up with dimensionals. I also used the gorgeous Dazzling Diamonds glitter to add that little sparkle - just perfect for Mum. The sentiment is layered on a separate piece or used with the modern label punch. I have also done the same style of cottage garden using the current set Best of Everything, in a different colour set- Wild Wasabi, Regal Rose and Night of Navy.